Syariah Divorces or Muslim Divorces in Singapore are adjudicated by the Syariah Courts pursuant to the Administration of the Muslim Law Act. In the event of a Muslim divorce, any marriage in Singapore that was registered under the Registry of Muslim Marriages will have to go through Syariah Divorce Proceedings in the Syariah Courts located at Lengkok Bahru. 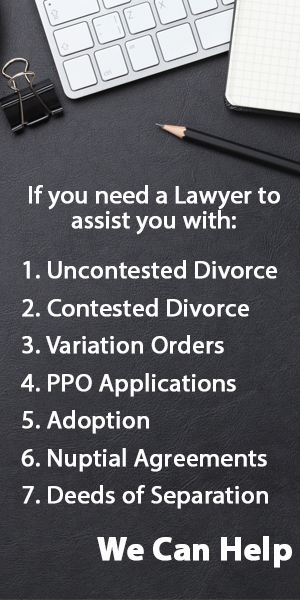 This process is different from the civil divorce process and there is no option for simplified divorce proceedings. Hire us to do your Syariah Divorce (Muslim Divorce). We answer all your queries within 24 hours. 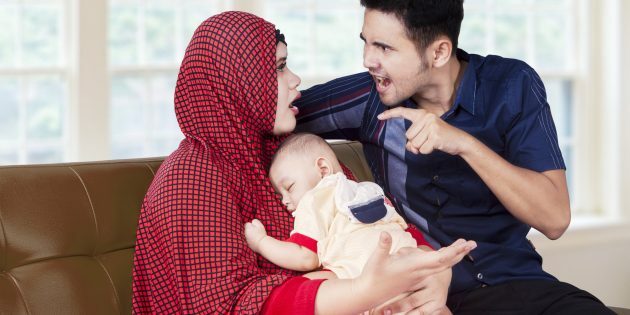 What Do I Need to Do to Initiate a Syariah Divorce in Singapore? The process for men and women are the same here. To initiate a Syariah Divorce, parties should fill in the Registration form for divorce to the Syariah Court. Subsequently, the courts will refer both parties to a Marriage Counselling Programme at an appointed agency. If parties attend said counselling, and no agreement could be reached, the agency will then refer you back to court to begin your divorce proceedings. 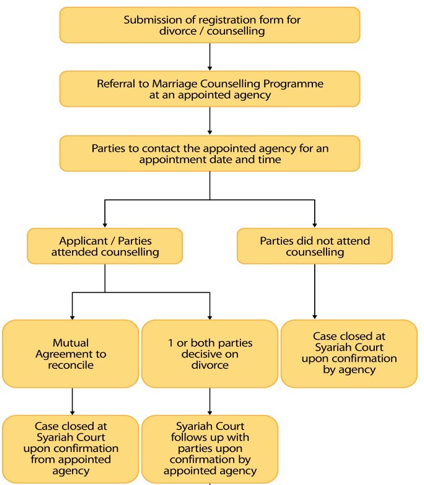 If a party or both parties did not attend the counselling, the matter will be closed in the agency and the Syariah Courts. After attending the counselling session(s), a notice of appointment will be sent to the party who indicated that he/she wishes to proceed with the divorce. He/she will have to file the originating summons on the date stipulated in the notice. be given a copy of the originating summons together with an appointment letter (the next appointment for mediation or pre-trial conference will be fixed within 12 weeks from the date of filing originating summons). If the marriage is registered in Singapore, the next appointment will normally be a mediation session. However, if the Defendant’s address is unknown or the Defendant has an overseas address or the marriage is registered overseas, the next appointment will be a pre-trial conference. The Plaintiff has to be present and punctual on the day of filling or originating summons failing which his/her case will be closed. You will be served with the originating summons and you are to acknowledge receipt of the originating summons. If you are present at the time of filing the originating summons, you will be served at that juncture. You must complete the memorandum of defence and file it at a prescribed fee of $36 within 21 days from the date you receive the originating summons (i.e. before the mediation session) and serve a copy on your spouse. Latest CPF statements showing the balance in your Ordinary, Special, Medisave, Retirement and Investment accounts. How Do I Commence Syariah Divorce Proceedings? Once the Case Statement is successfully completed, this form and the necessary documents that you would have been advised to attain have to be filed in the Syariah Courts personally. From there, if the other party can be identified, the matter will proceed to a mediation. If the other party cannot be identified, the matter will proceed to a Pre-Trial Conference. 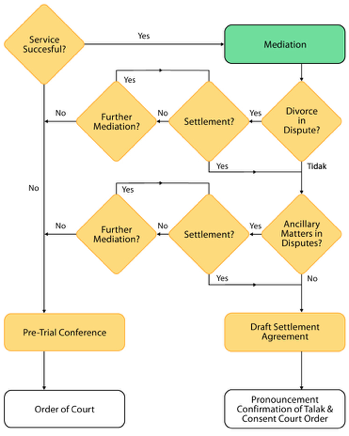 The objective of mediation is to help parties resolve their disputes in an amicable manner without having to go through a contested hearing. The disputes may relate to the ground of divorce and/or the ancillary matters (i.e. division of matrimonial assets, children, nafkah iddah & mutaah). Parties will attend at the Syariah Court and a mediator will facilitate a discussion to resolve the issues between parties. The mediator will explore reconciliation and if necessary, refer parties to counselling. If the parties do not wish to reconcile, the mediator will assist parties to reach a settlement on the ancillary matters. The attendance of the Plaintiff and the Defendant is compulsory. If the Plaintiff is absent, the case will be closed. If the Plaintiff attends but the Defendant is absent, the matter may be fixed for further mediation or pre-trial conference. Parties can choose to speak in English or Malay during the mediation. The time allocated for each mediation session is 60 minutes. A further mediation will be scheduled if it is necessary for parties to obtain further information or consider proposals for settlement. What Happens During A Pre Trial Conference? The objective of a Pre-Trial Conference is to prepare parties for the divorce hearing. A Pre-Trial Conference is conducted by the Registrar or the Deputy Registrar who will give the appropriate directions. The time allocated for each Pre-Trial Conference is 15 minutes. If parties or their lawyers are absent, the case may be struck off and the file closed. If there is a possibility of settlement, the Court may refer the matter back to mediation. A mediation will be scheduled on another date.